(CNN) — The Indian fighter pilot captured by Pakistan after his plane was shot down in a dogfight has become an unlikely fashion trendsetter following his return to India. 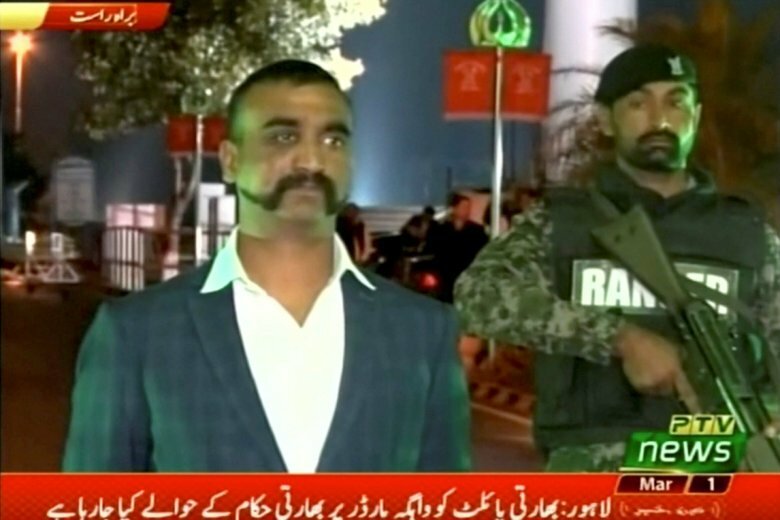 Wing Commander Abhinandan Varthaman became the unwitting face of cross-border tensions after crashing in Pakistani territory last week. Hailed as a national hero, men across India have rushed to emulate his characteristic mustache in apparent tribute. India became gripped by Varthaman’s capture after several videos showing him in custody were released by Pakistan’s Information Ministry. His calmness in the videos — in one he is seen sipping tea — resonated with both Indians and Pakistanis, many of whom adopted his image in their calls for peace between the two countries on social media. But it was Varthaman’s distinctive facial hair that really captured people’s attention. Since it was posted on Saturday, the ad has been viewed thousands of times. Varthaman’s now famous mustache was again on show during his televised return to India. Dressed in a blue blazer and white shirt, a solemn-looking Varthaman crossed the Wagah border on foot late on Friday evening, where he was met by Indian troops. In the hours leading up to his arrival, hundreds of Indians carrying flags and musical instruments gathered at the border to welcome Varthaman back. Indian Prime Minister Narendra Modi sent well-wishes to the pilot after the handover in a post on Twitter. “Welcome home Wing Commander Abhinandan! The nation is very proud of your exemplary courage,” he tweeted Friday. Varthaman was later taken to hospital for additional medical checks.